Beautifully welcome friends and family to your home! Up to 30 participants. Sign up online here, by phone, or in person. 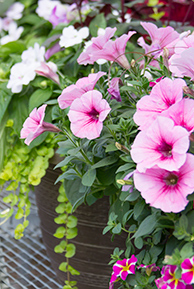 Plant up a 16"D porch pot with a gorgeous mix of fancy plants! This will not be the everyday patio planter you can find anywhere else. Class is held Saturday afternoon, May 18 from 2:00-3:30pm at Viviano Flower Shop, 32050 Harper Ave., St. Clair Shores, MI 48082. Please arrive early for registration completion if not already paid in full. Workshop fee: $75, payable in full; or reserve your place with a $10 deposit and pay the $65 remainder upon arrival. Hands-on guidance and all materials are provided. Let us know: sun or shade? Is your home on the sunny side of the street (facing South or West), or have you got it made in the shade (facing North or East)? Please note "sun" or "shade" after each Attendee name when you sign up so we know which kind of plants to provide that will thrive for you! One make and take project is provided per paid registration; a friend or child is welcome to share yours at no extra charge. Plants and bloom colors will vary from example shown.